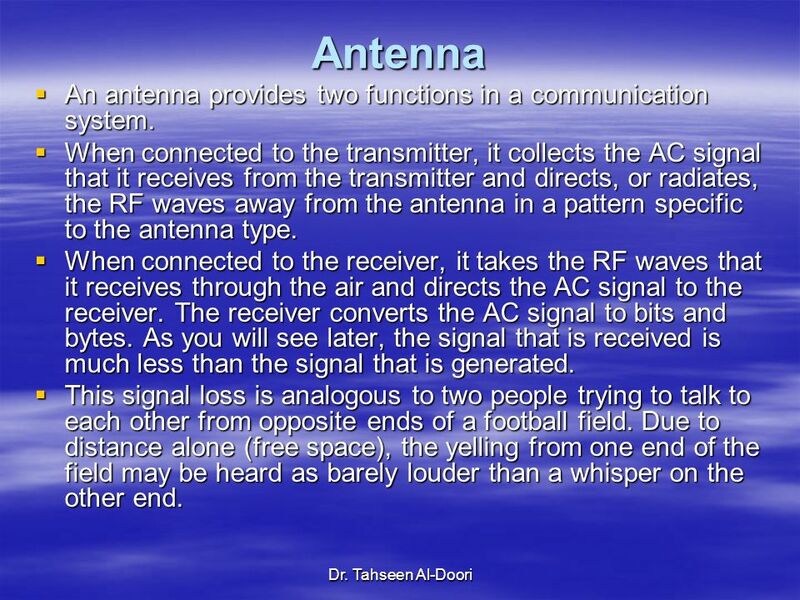 9 Antenna An antenna provides two functions in a communication system. 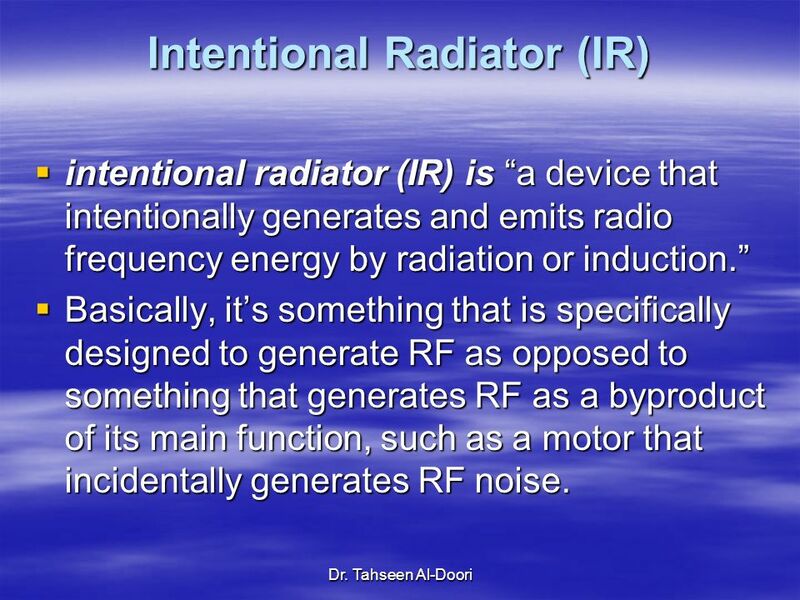 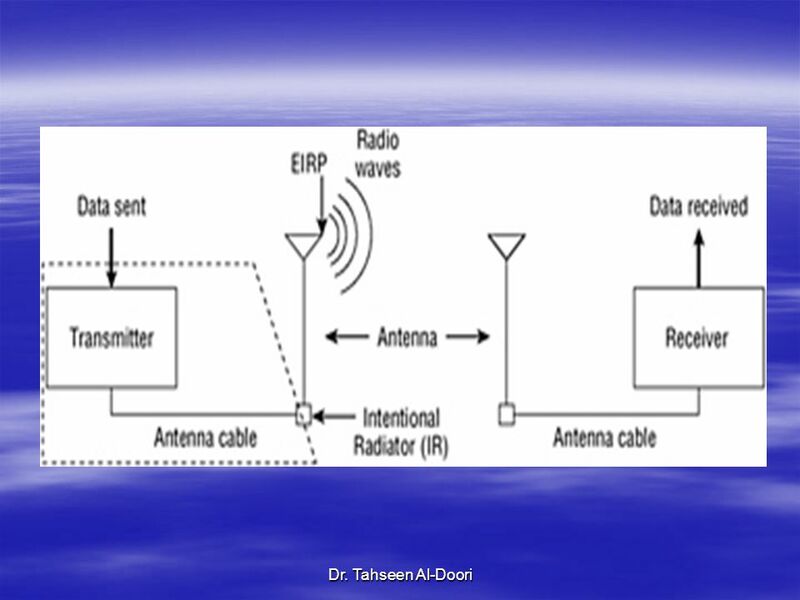 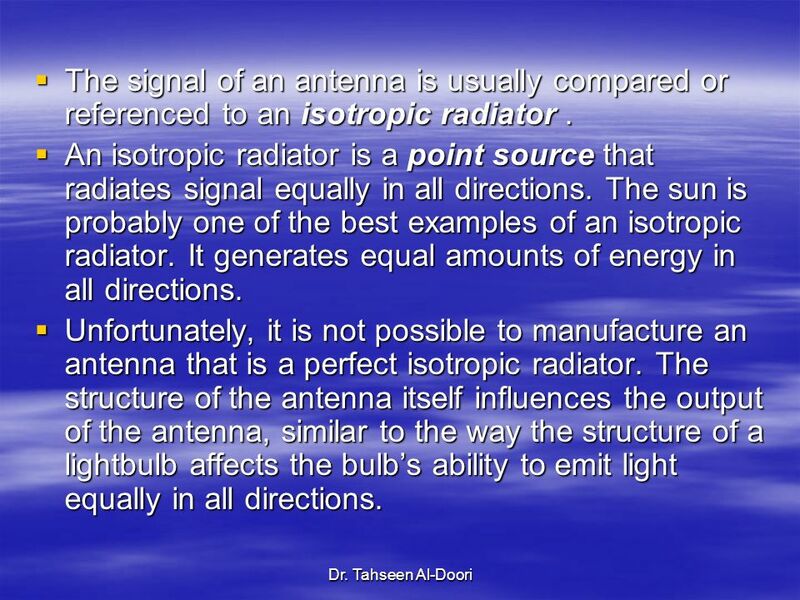 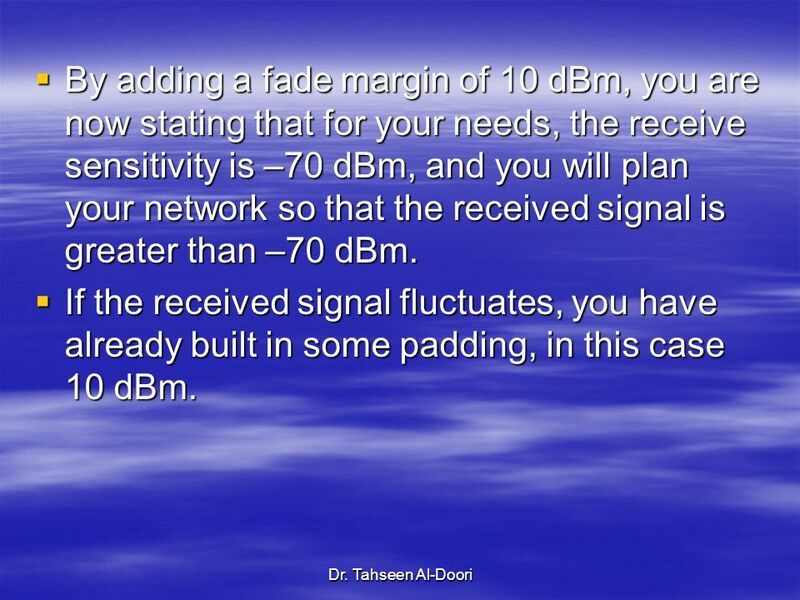 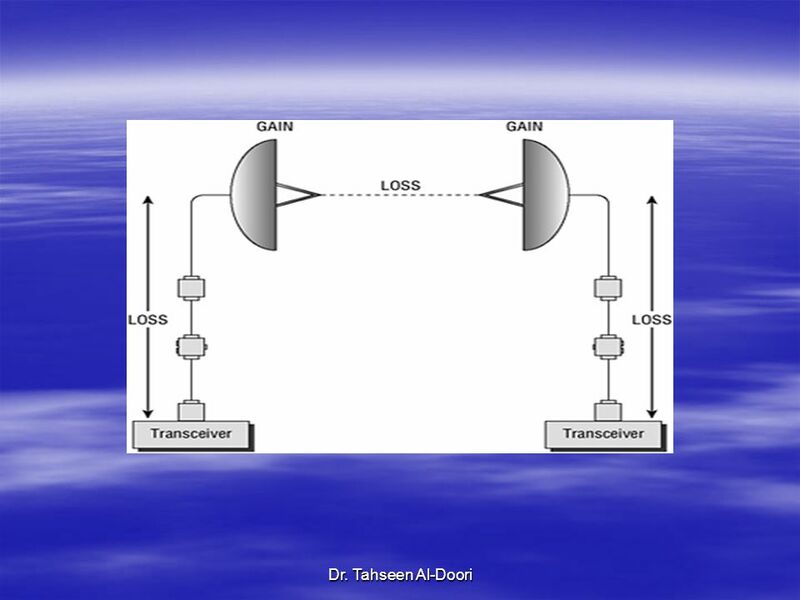 10 The signal of an antenna is usually compared or referenced to an isotropic radiator . 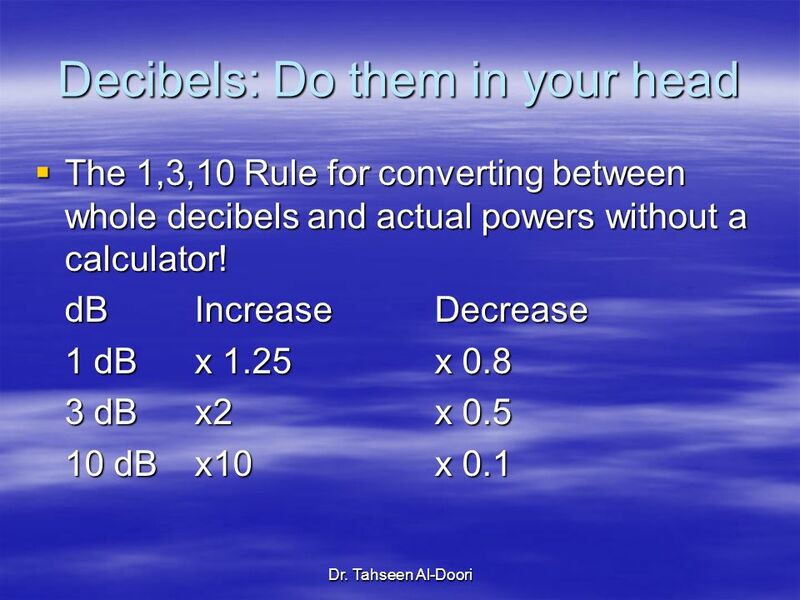 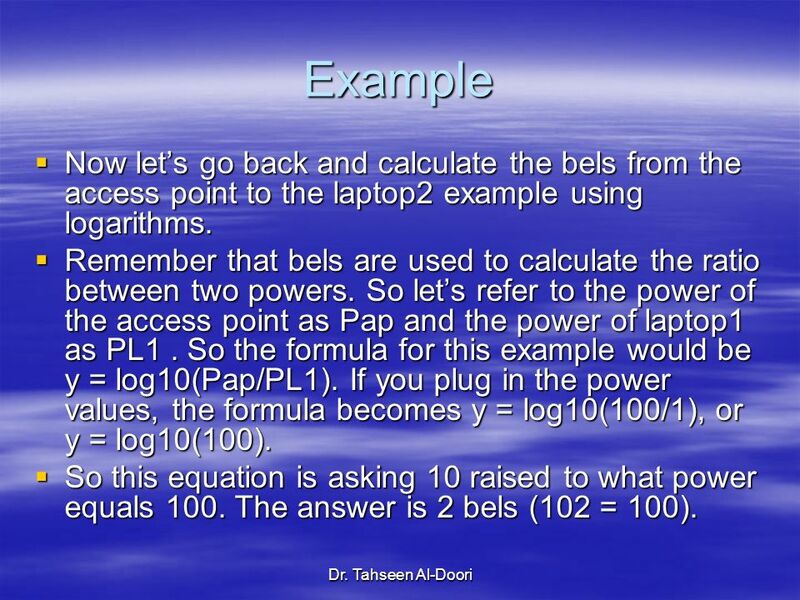 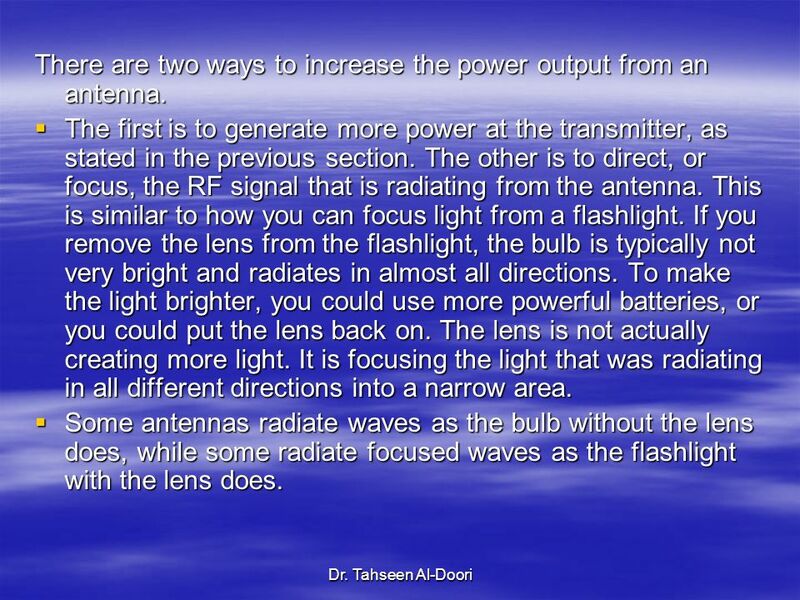 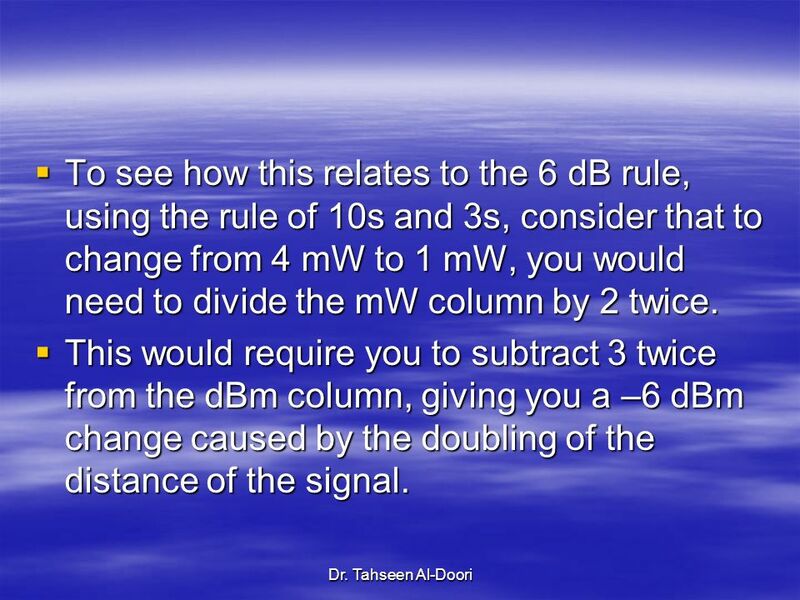 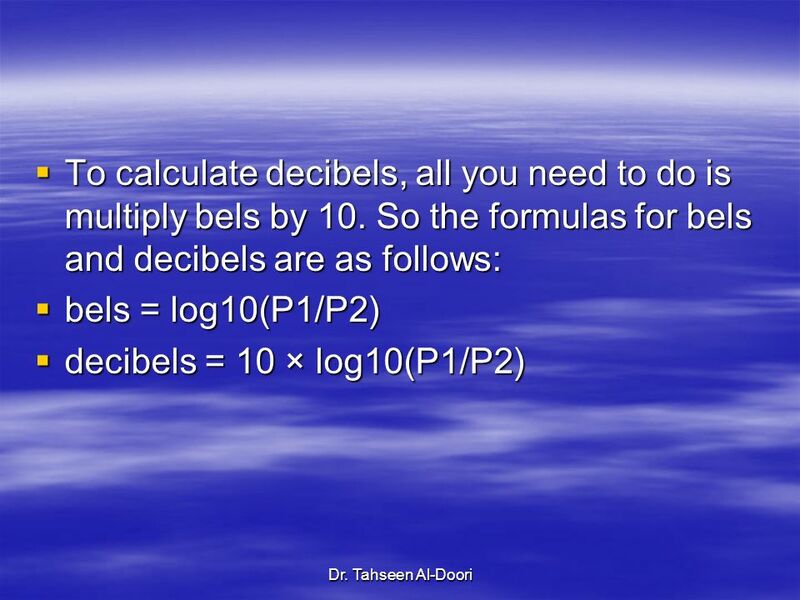 11 There are two ways to increase the power output from an antenna. 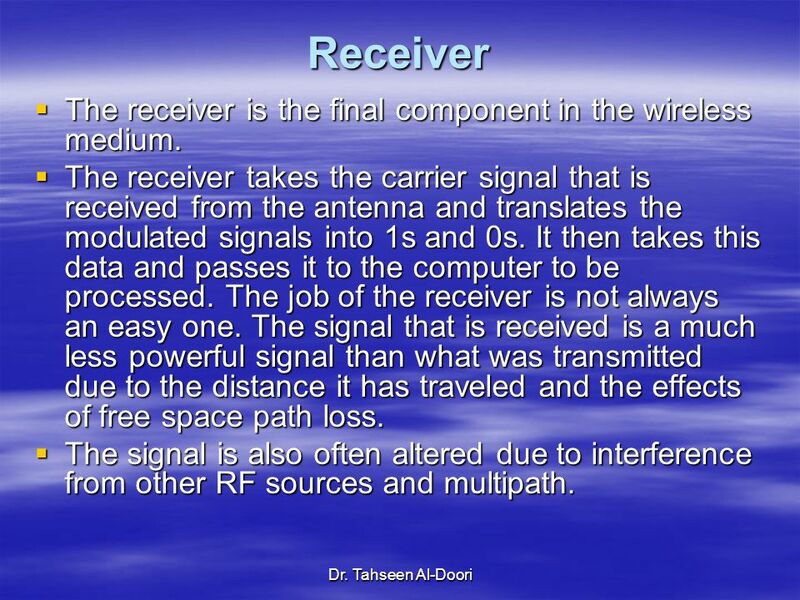 12 Receiver The receiver is the final component in the wireless medium. 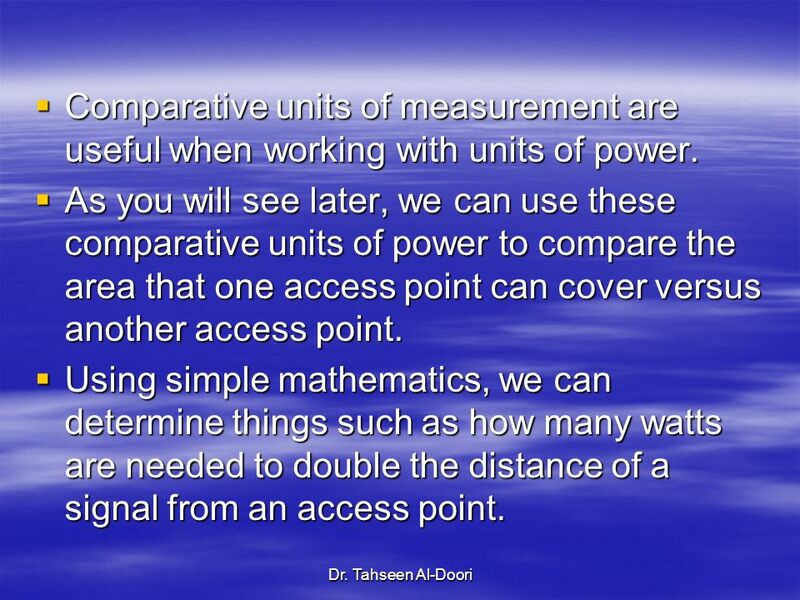 18 Comparative units of measurement are useful when working with units of power. 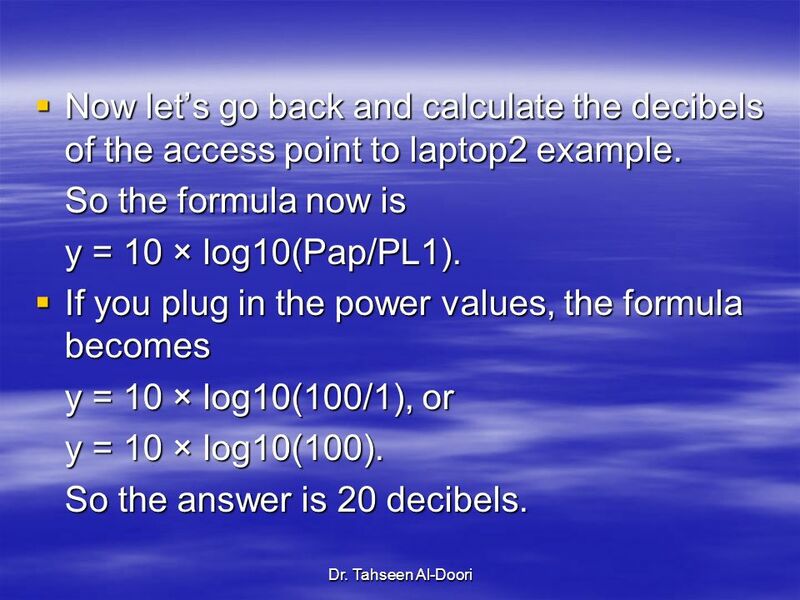 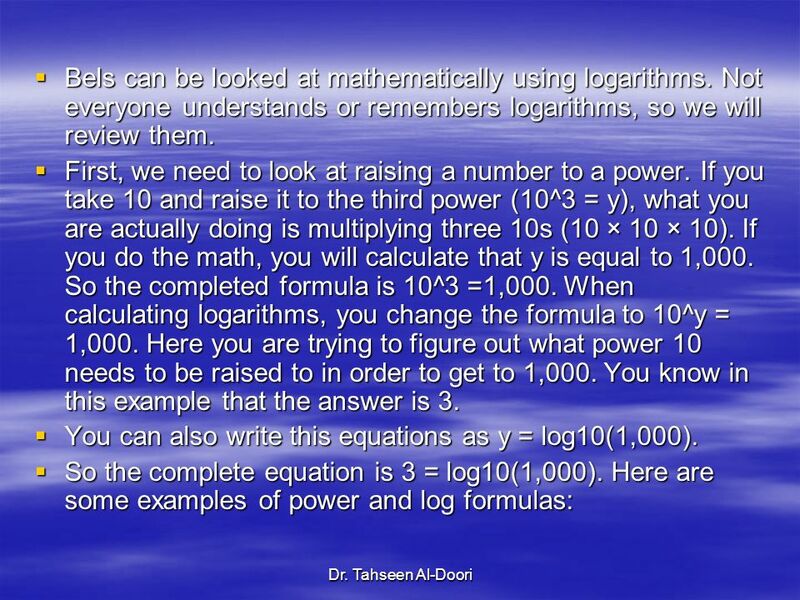 22 You can also write this equations as y = log10(1,000). 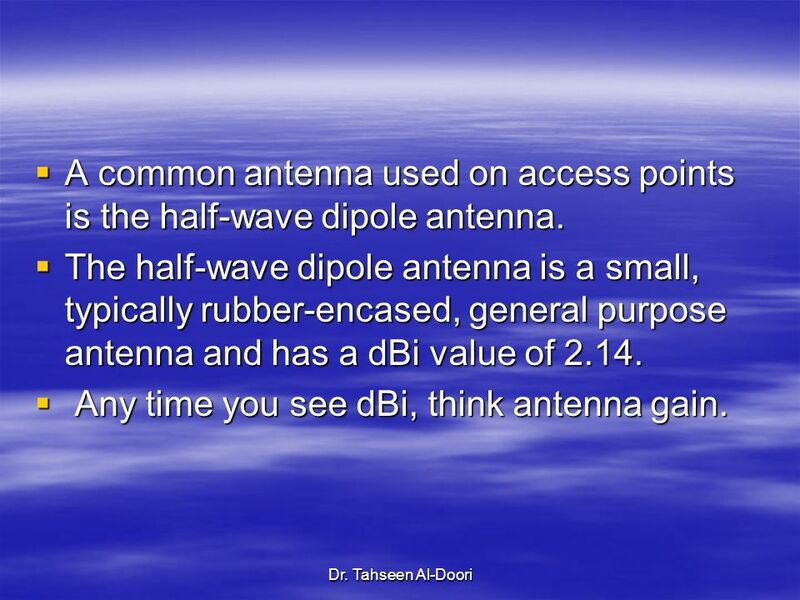 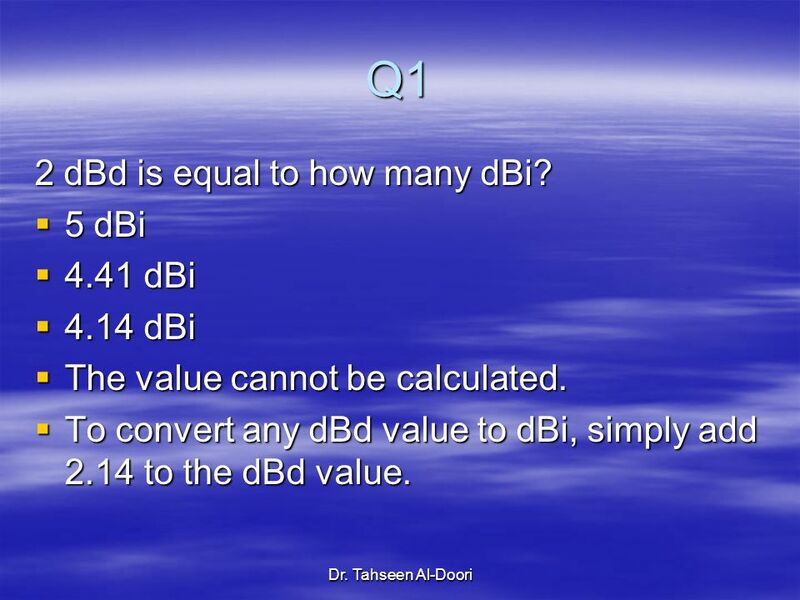 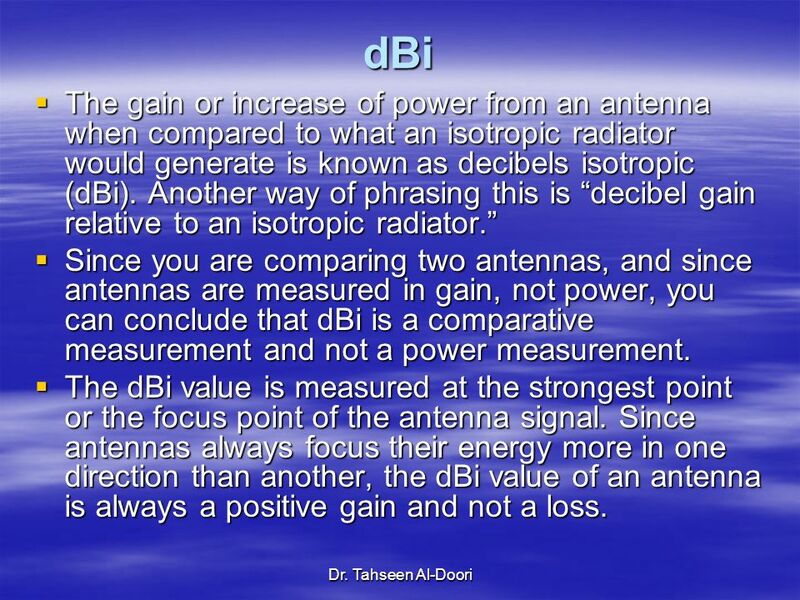 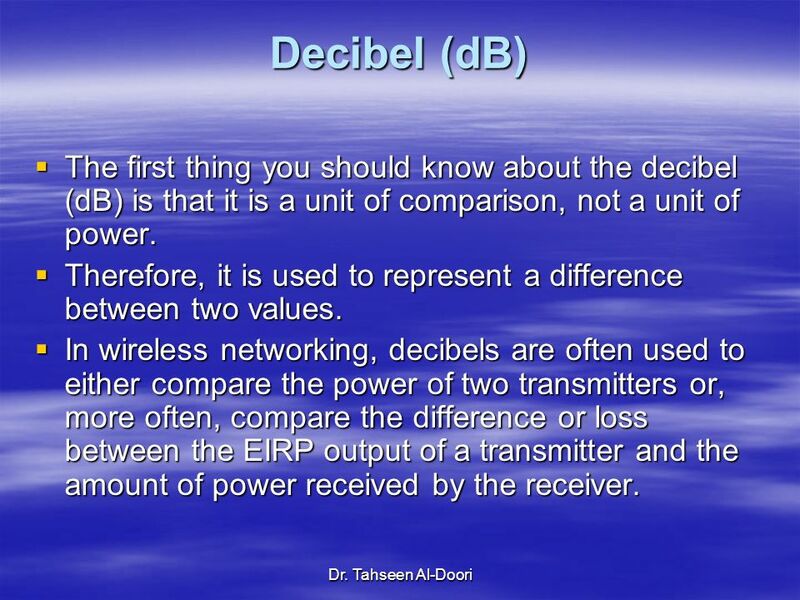 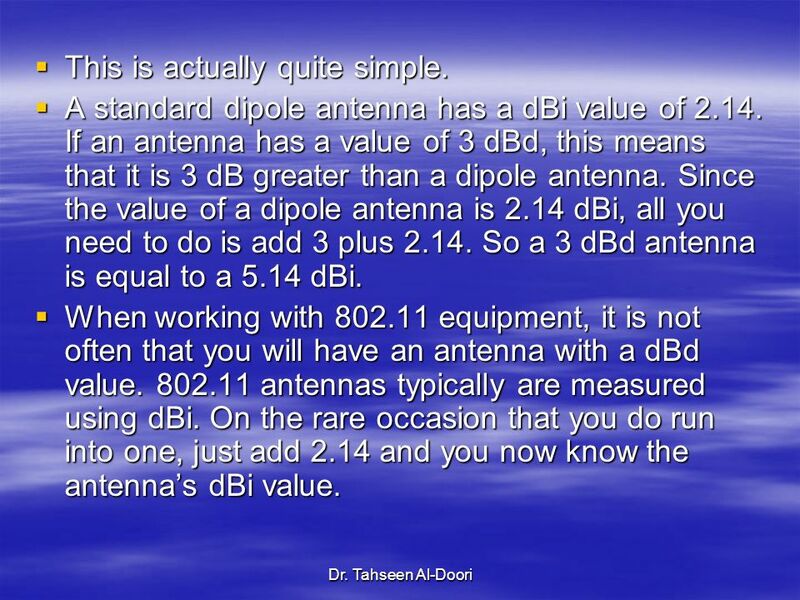 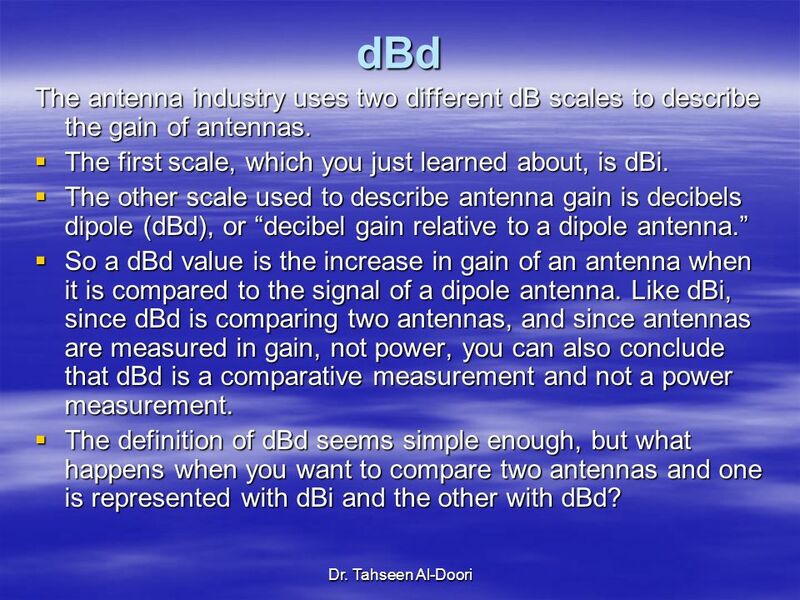 29 Any time you see dBi, think antenna gain. 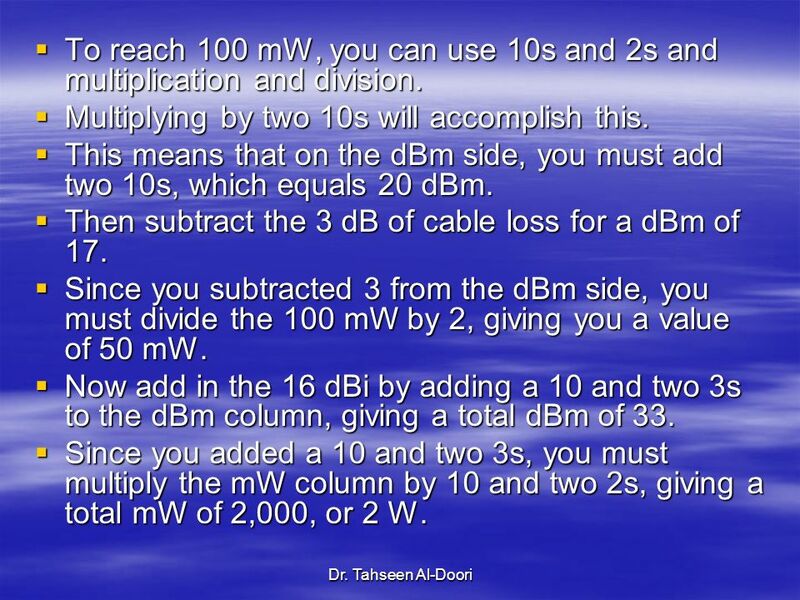 31 This is actually quite simple. 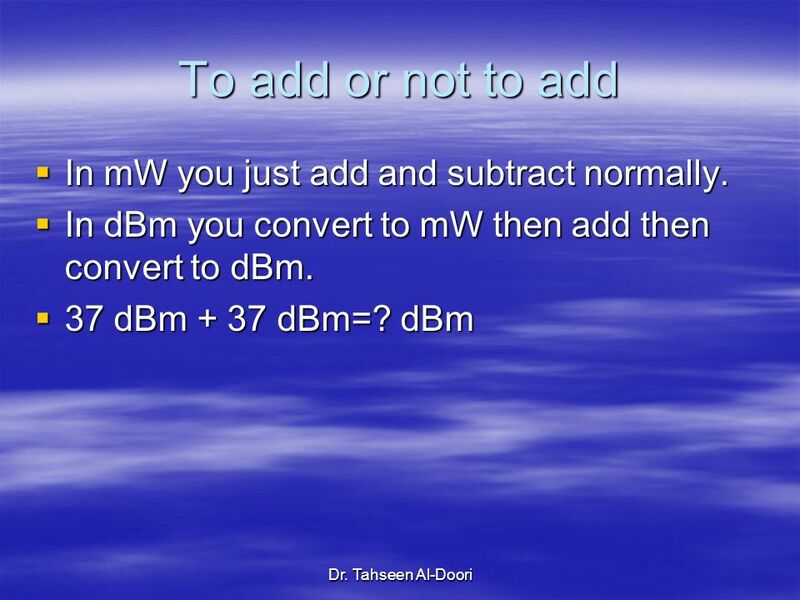 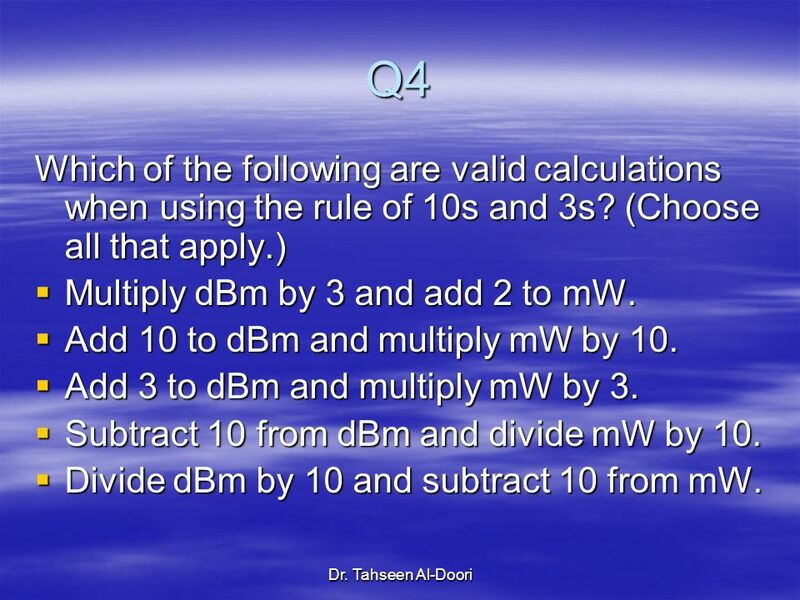 38 To add or not to add In mW you just add and subtract normally. 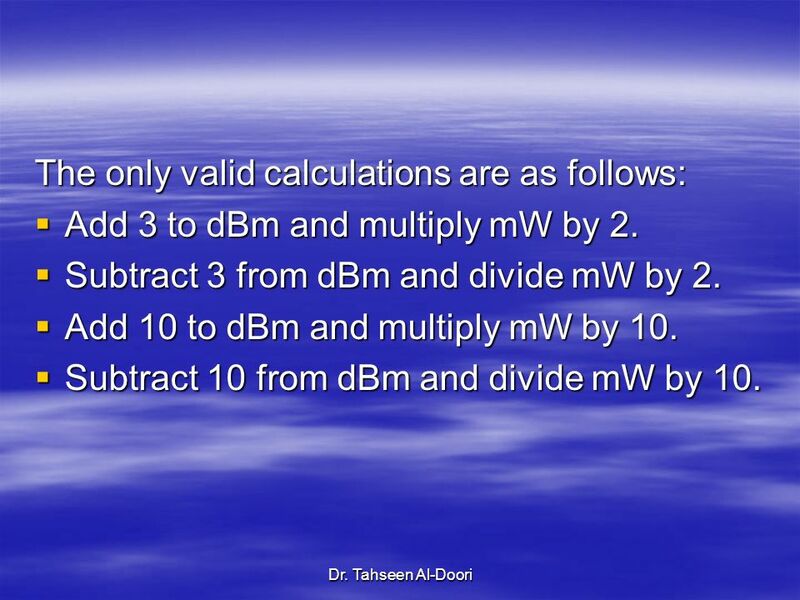 42 Multiplying by two 10s will accomplish this. 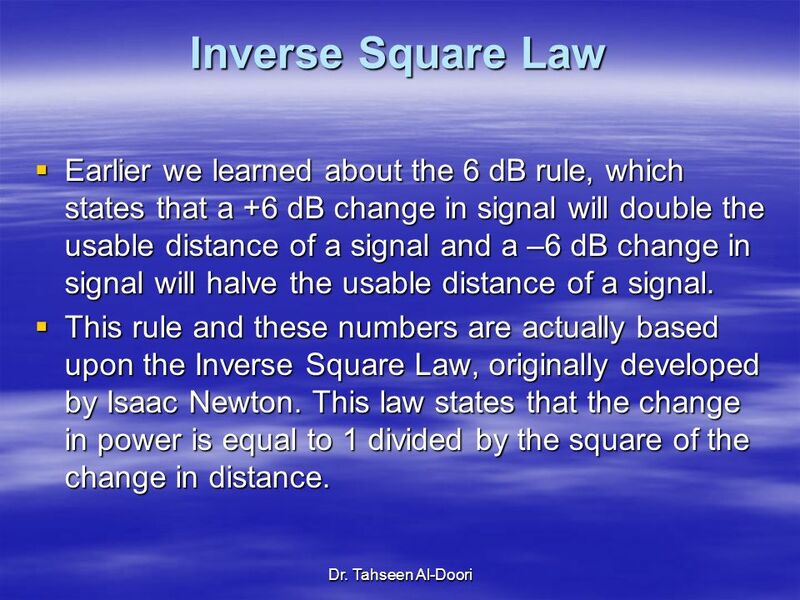 47 The lower No. 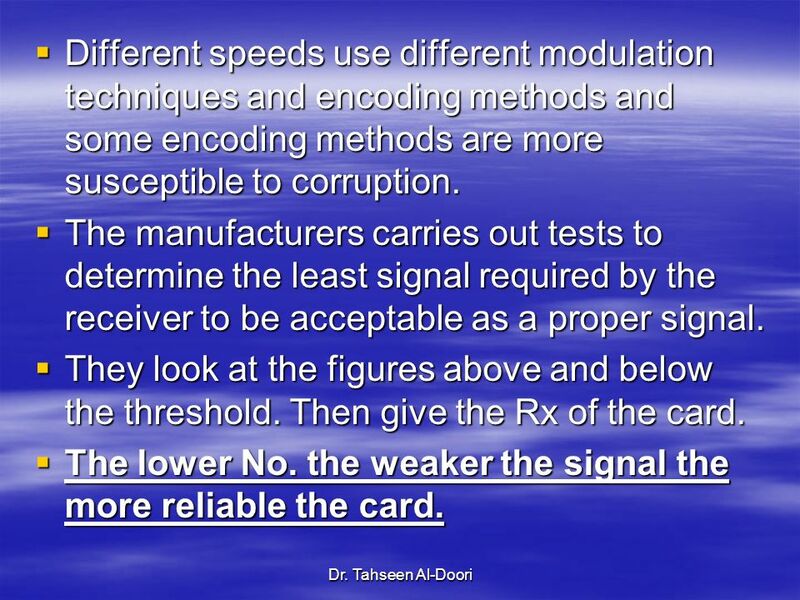 the weaker the signal the more reliable the card. 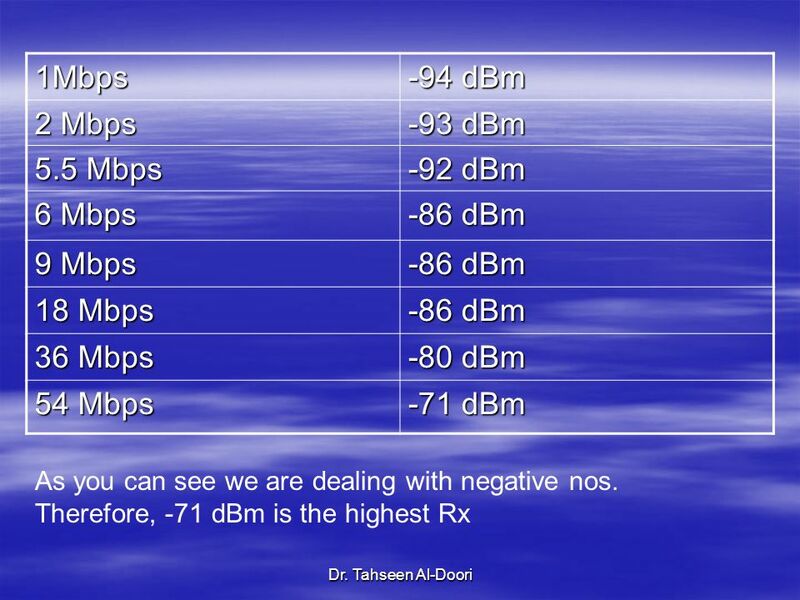 49 Typically, the faster the speed, the higher the receiver sensitivity. 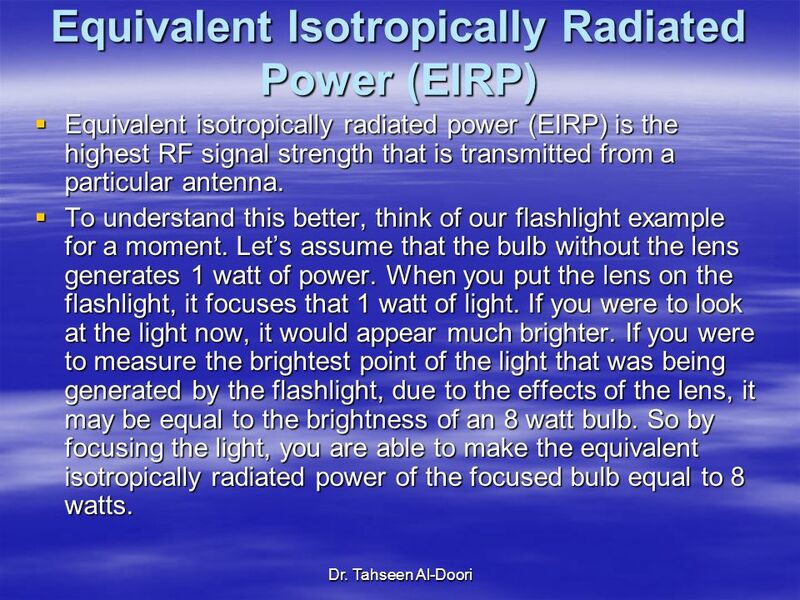 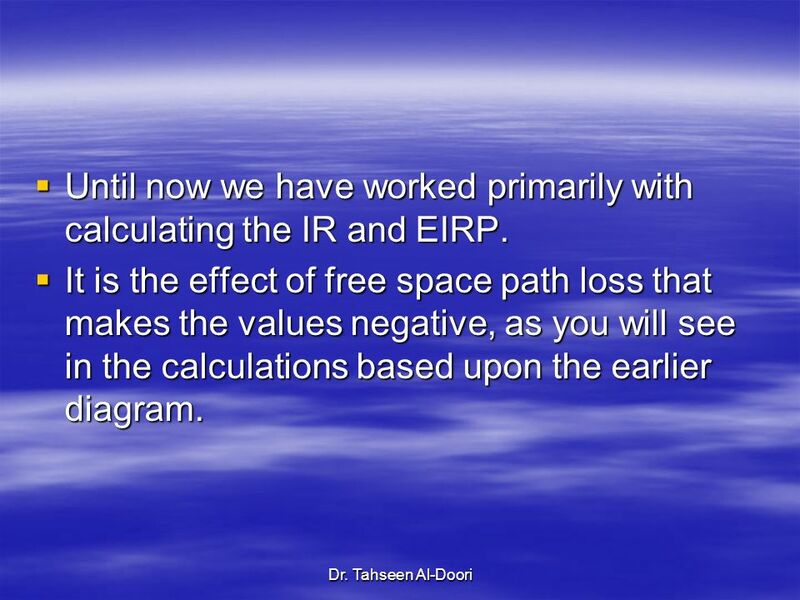 51 Until now we have worked primarily with calculating the IR and EIRP. 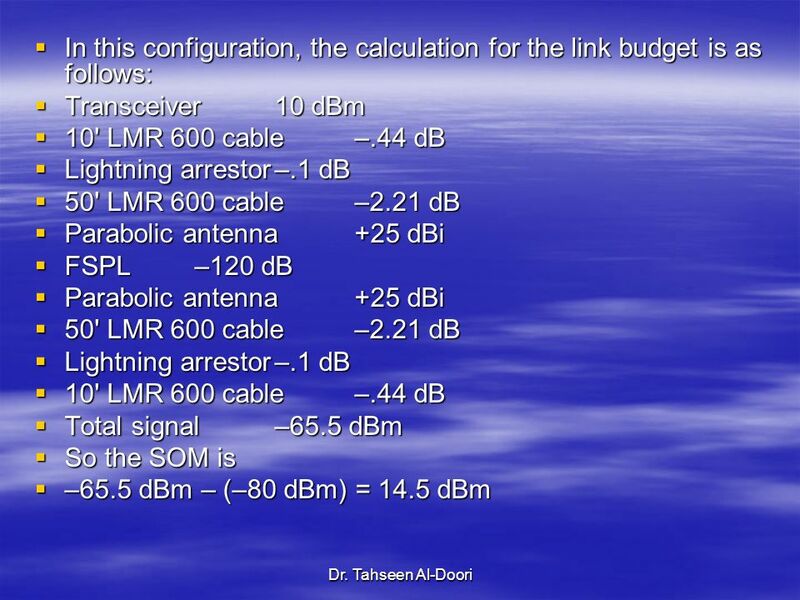 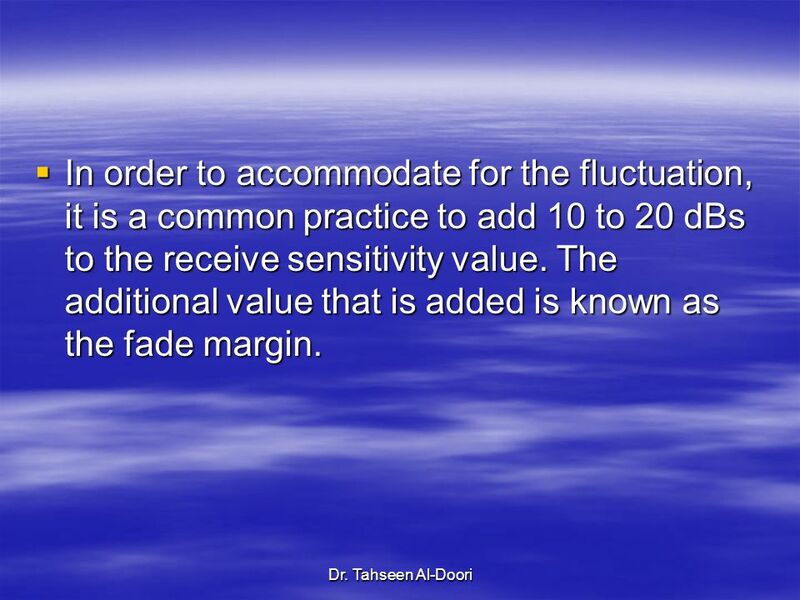 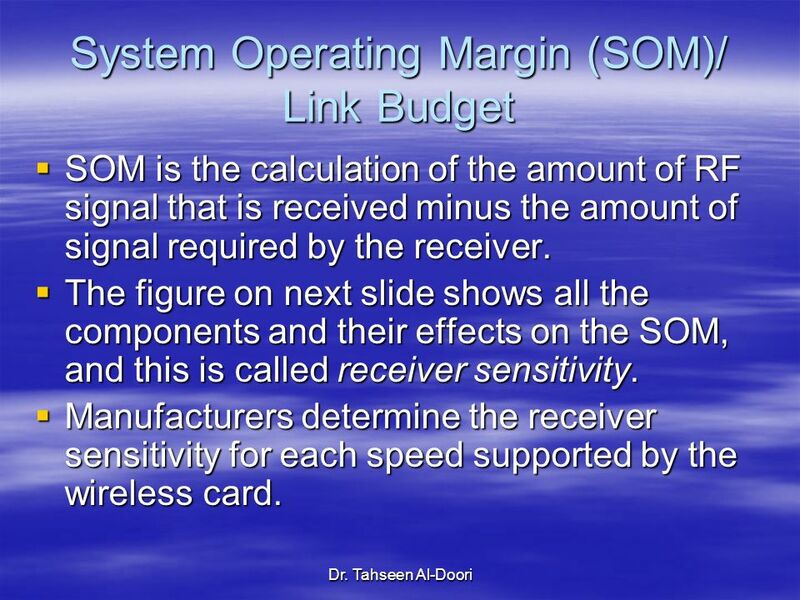 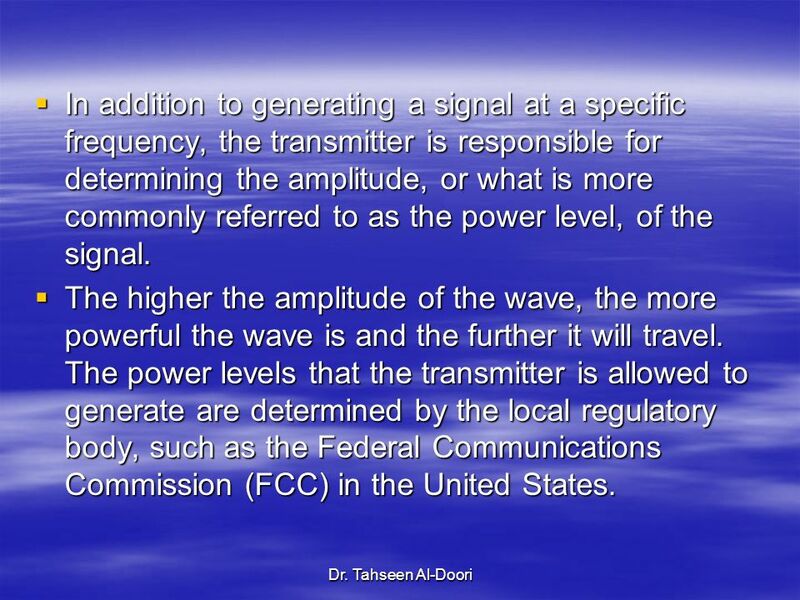 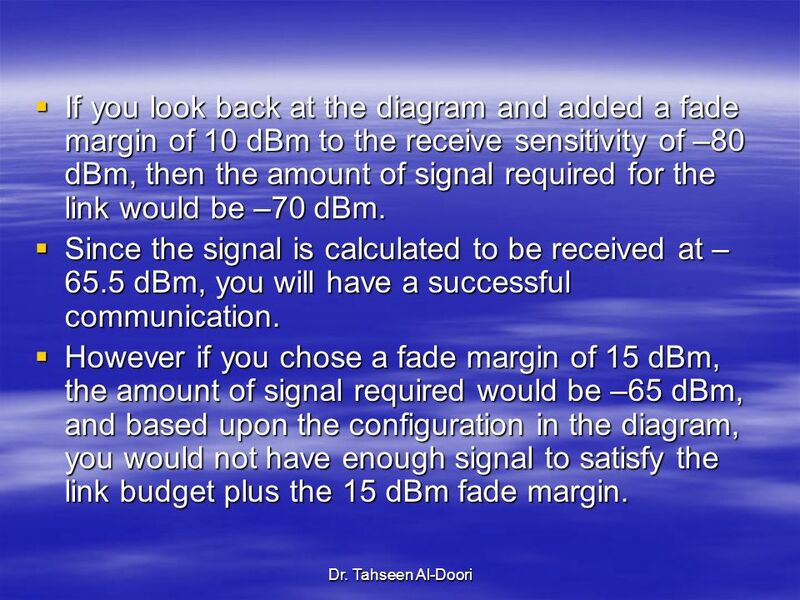 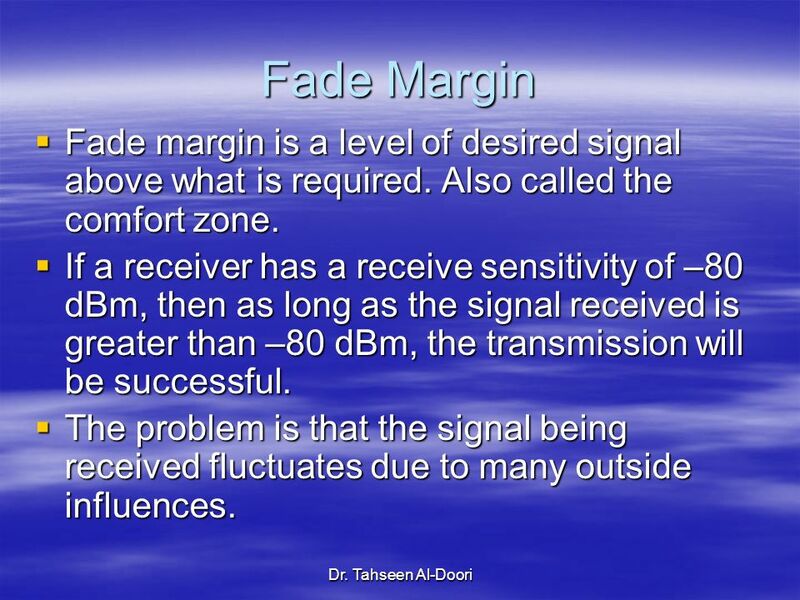 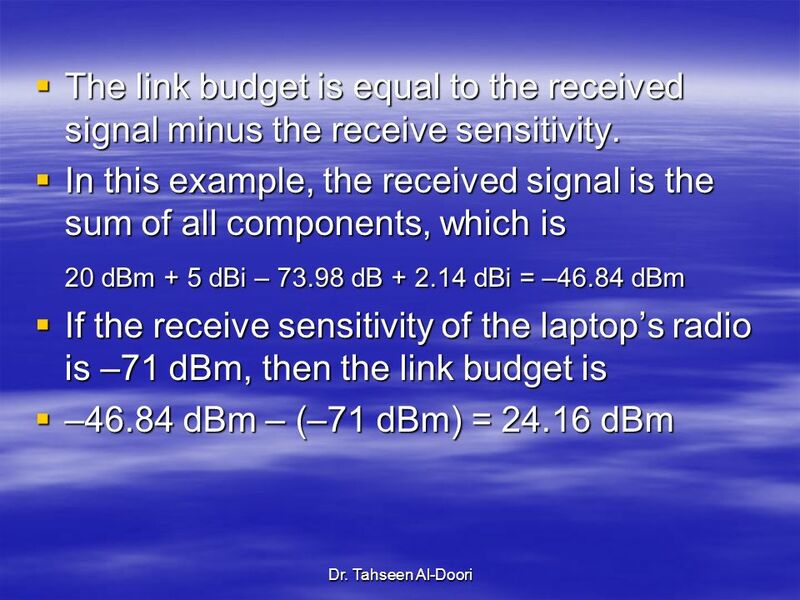 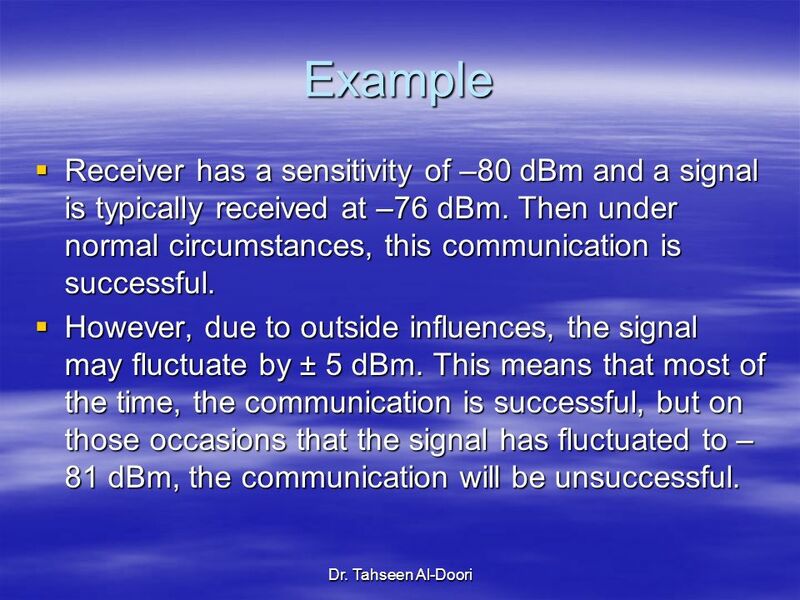 52 The link budget is equal to the received signal minus the receive sensitivity. 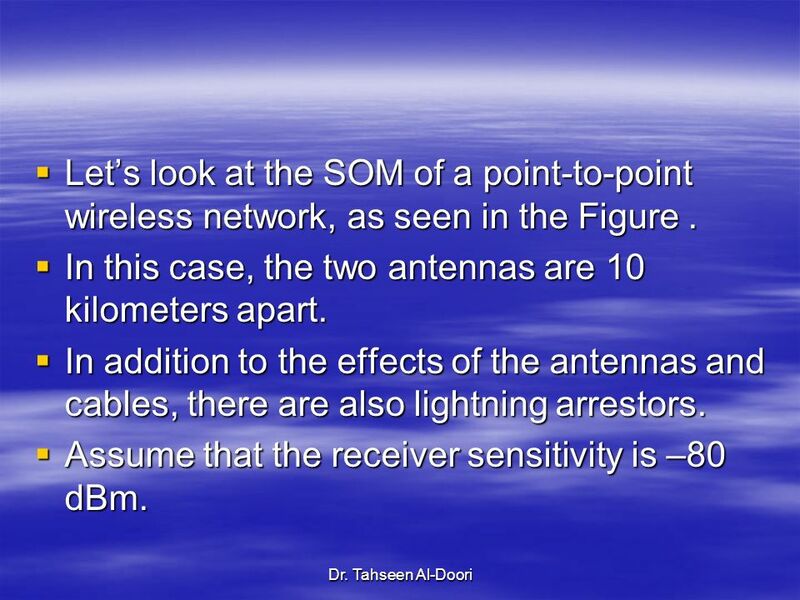 54 In this case, the two antennas are 10 kilometers apart. 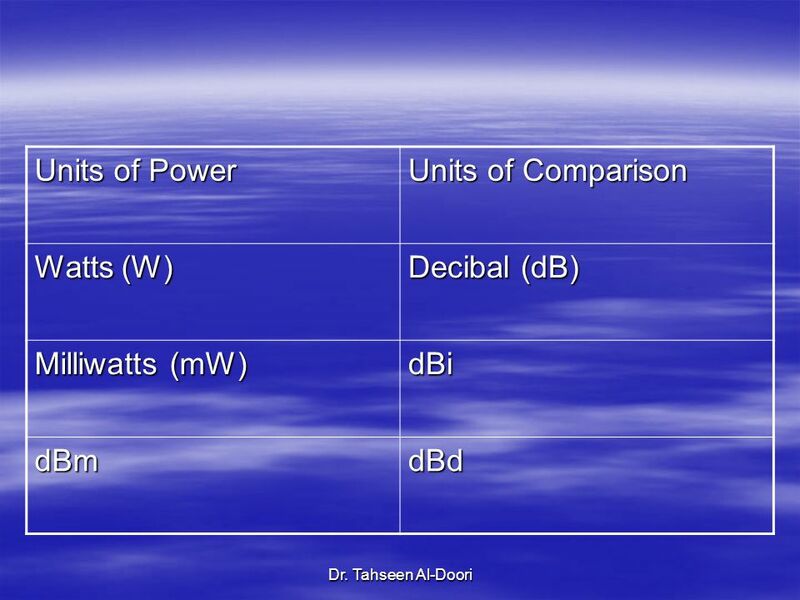 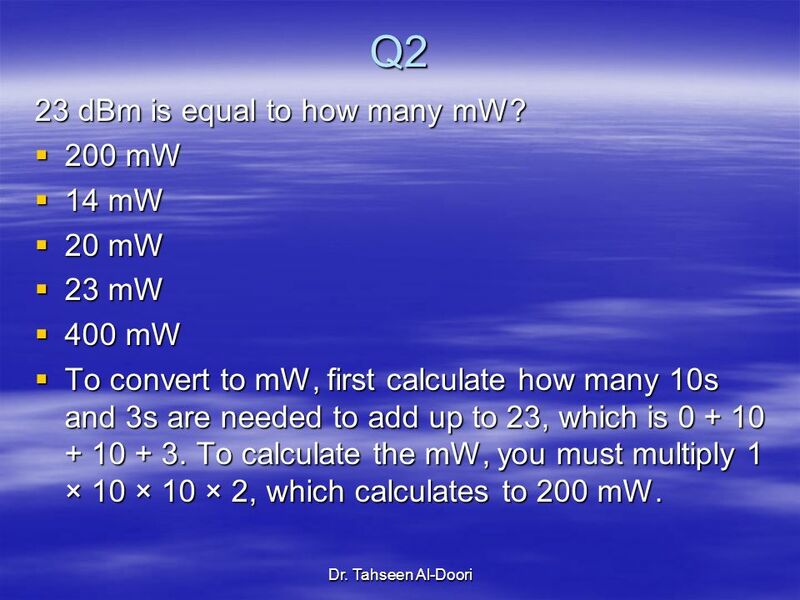 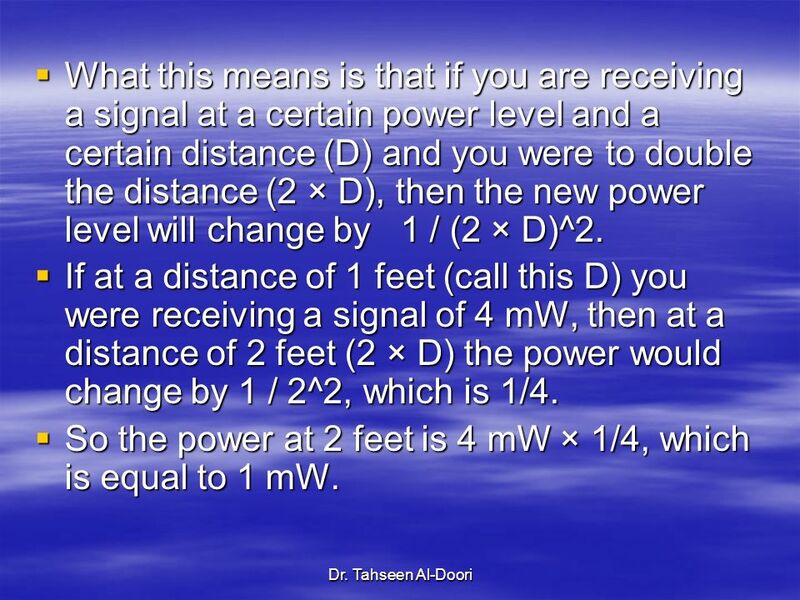 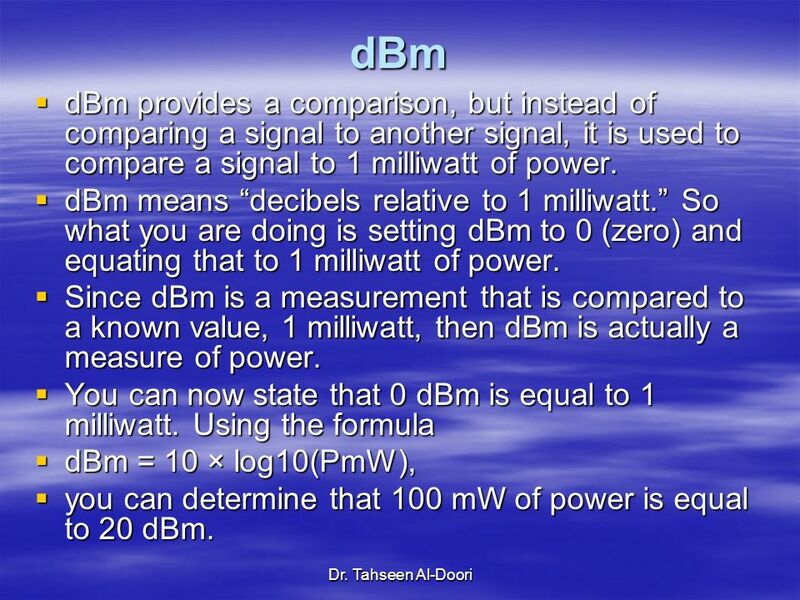 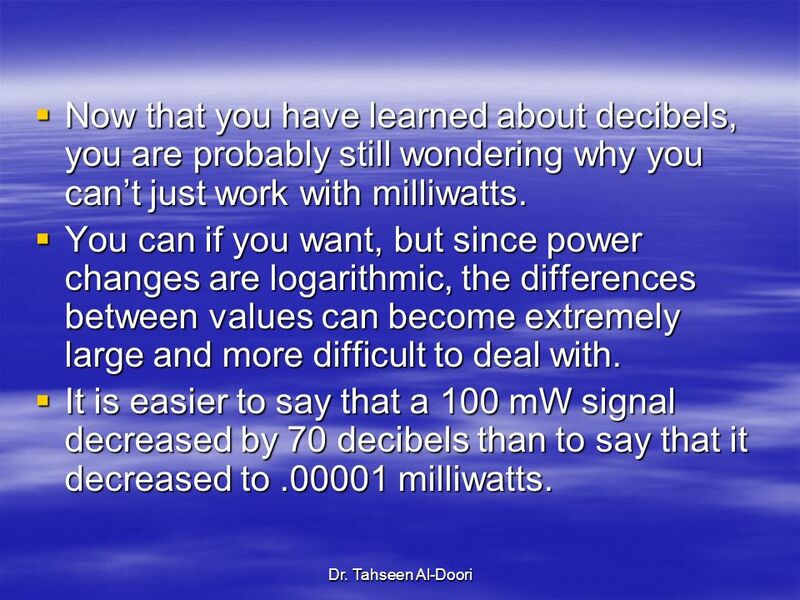 63 So the power at 2 feet is 4 mW × 1/4, which is equal to 1 mW. 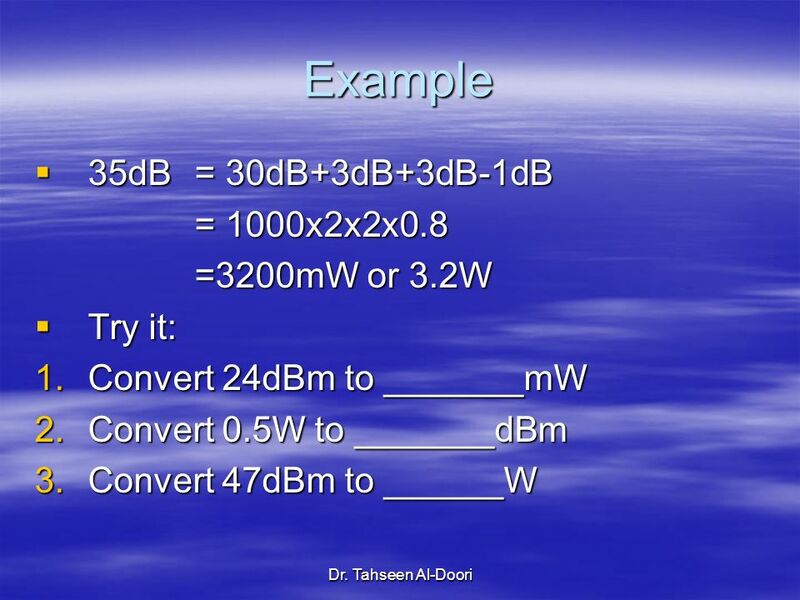 Download ppt "Radio Frequency Components, Measurements, and Mathematics"
VocabularyDay 1 CIM MA.A Associates Verbal Names With Written Names. 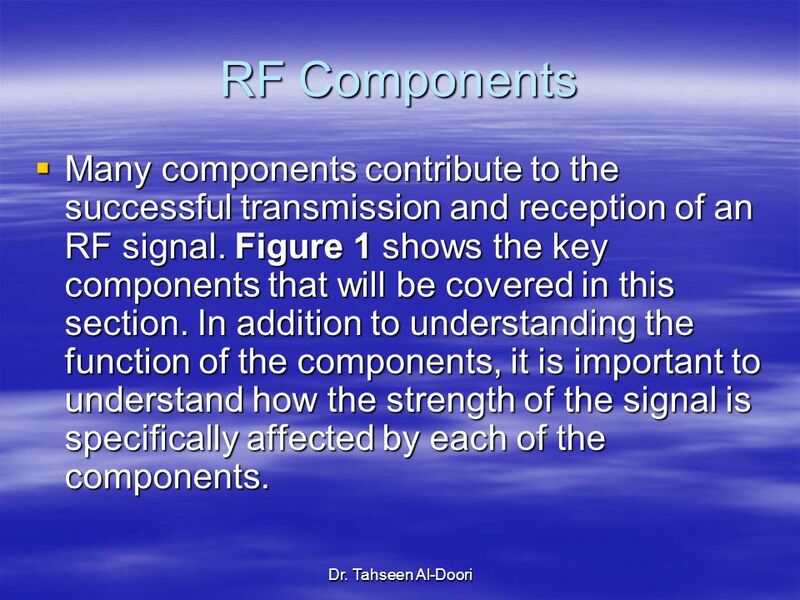 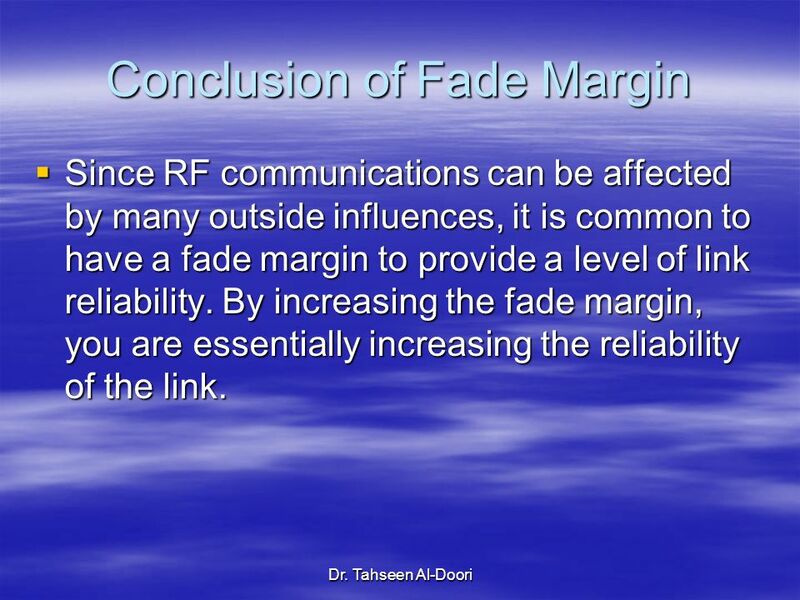 1 The Leader in Industrial Data Communication Solutions Training: RF Path – Will it work? 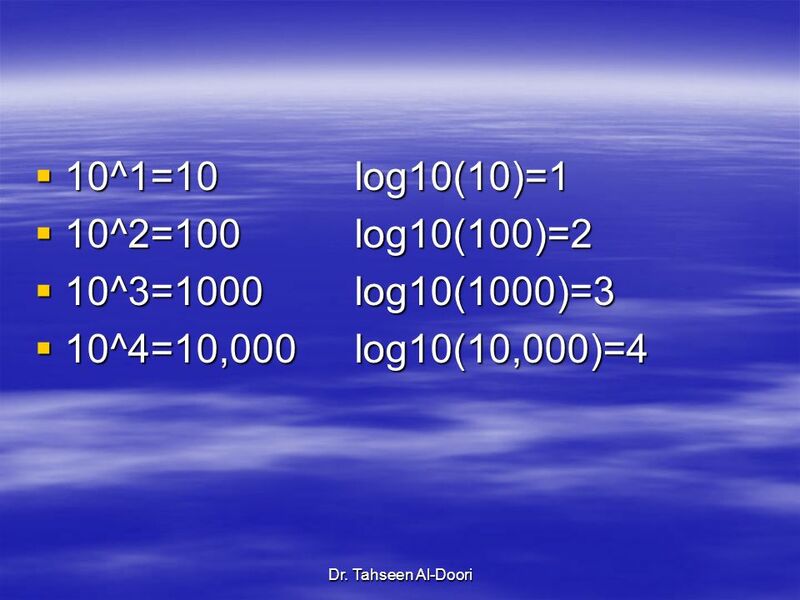 The Game of Algebra or The Other Side of Arithmetic The Game of Algebra or The Other Side of Arithmetic © 2007 Herbert I. 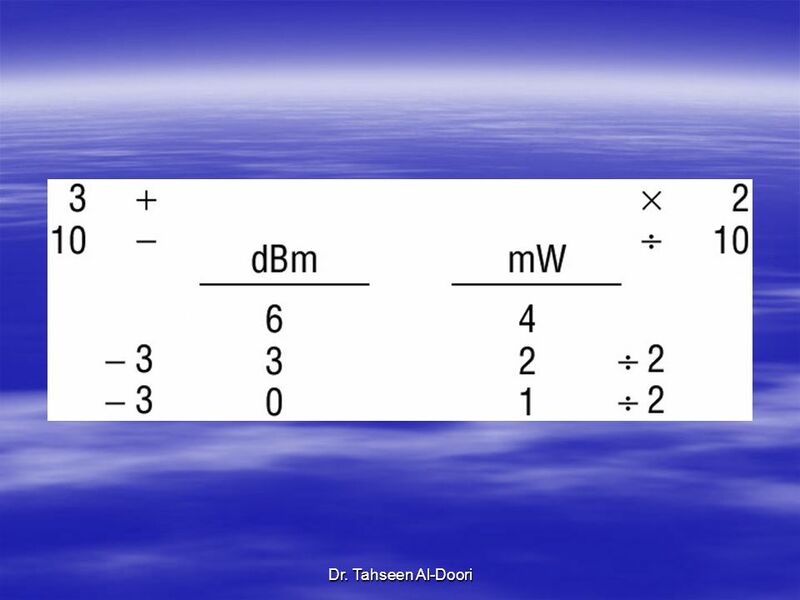 Gross by Herbert I. 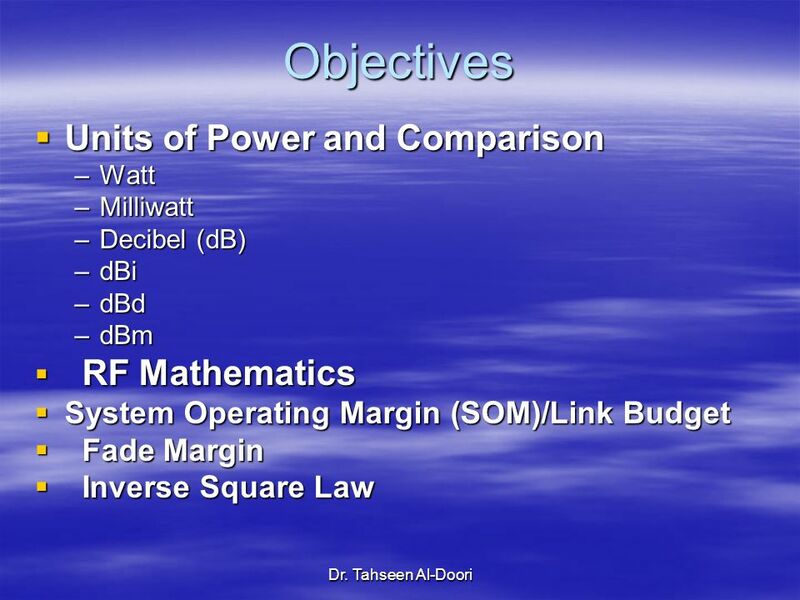 Gross & Richard. 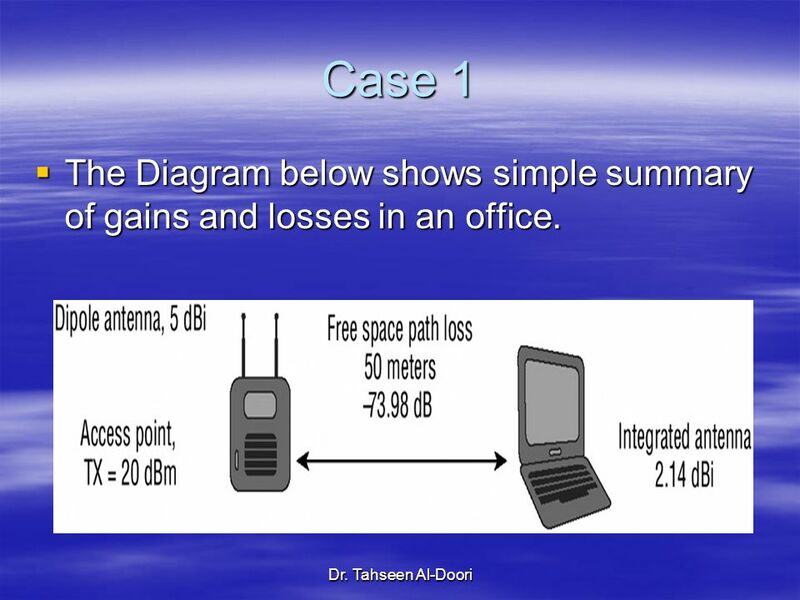 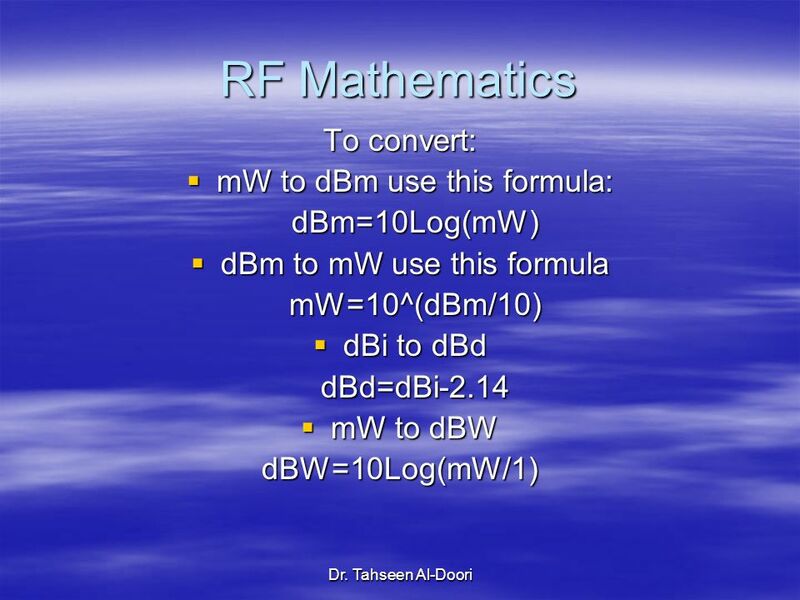 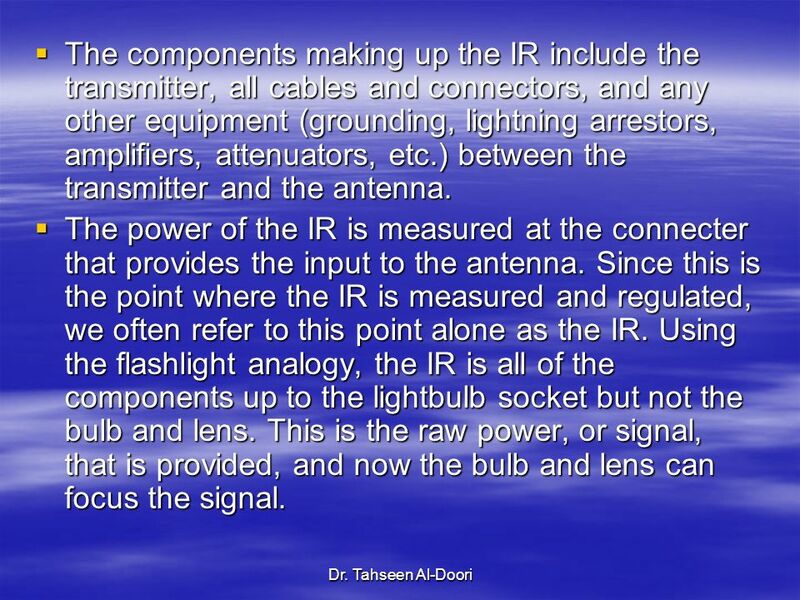 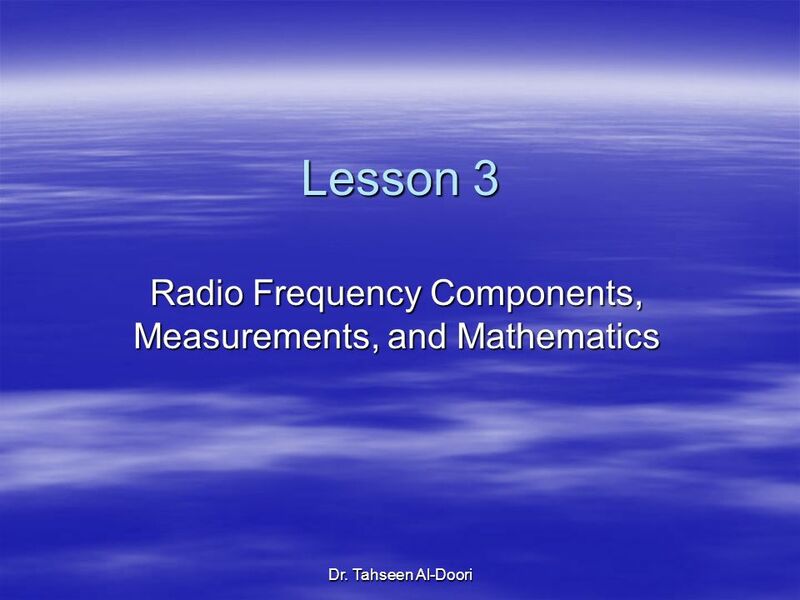 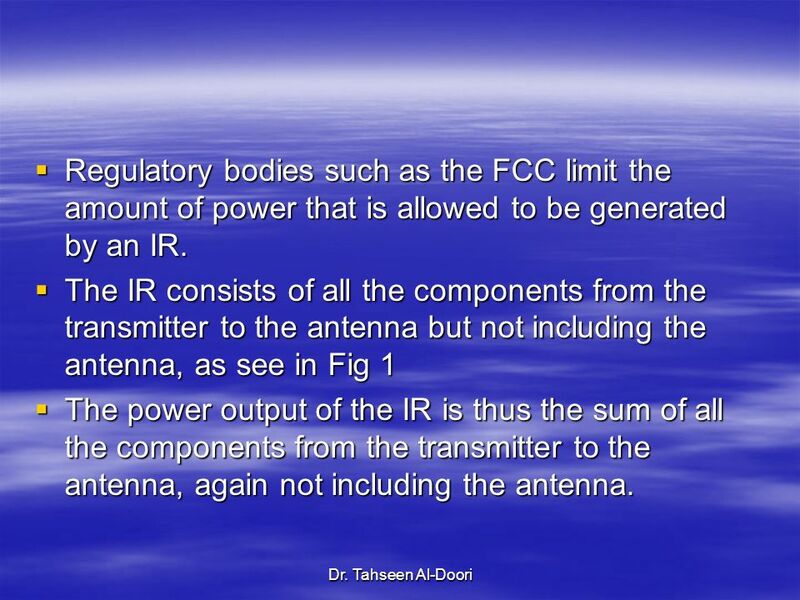 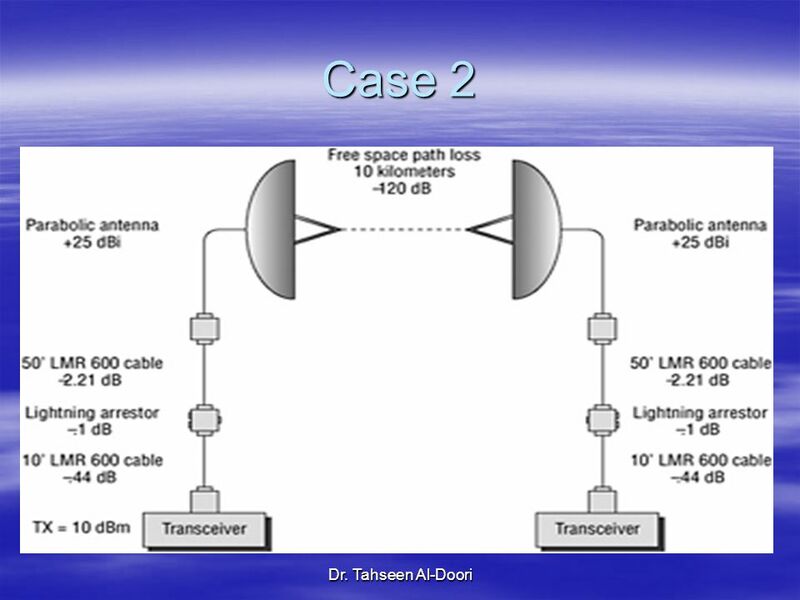 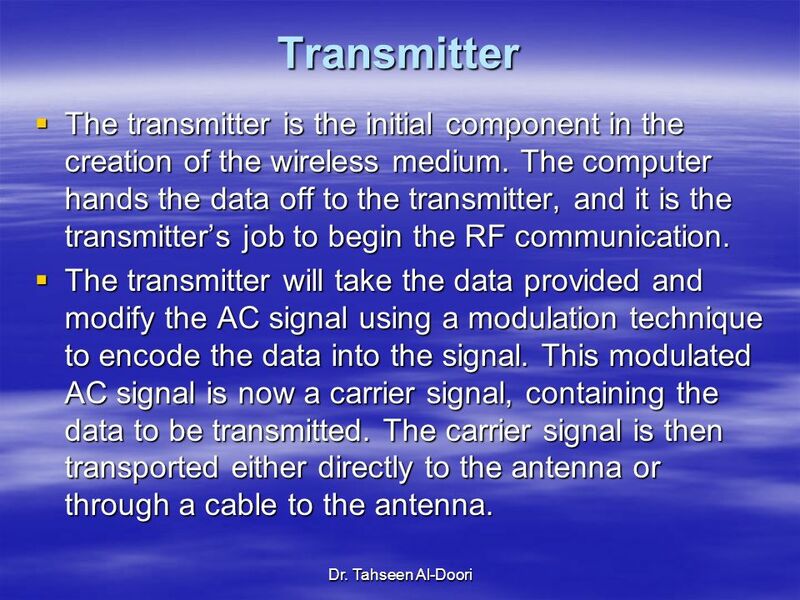 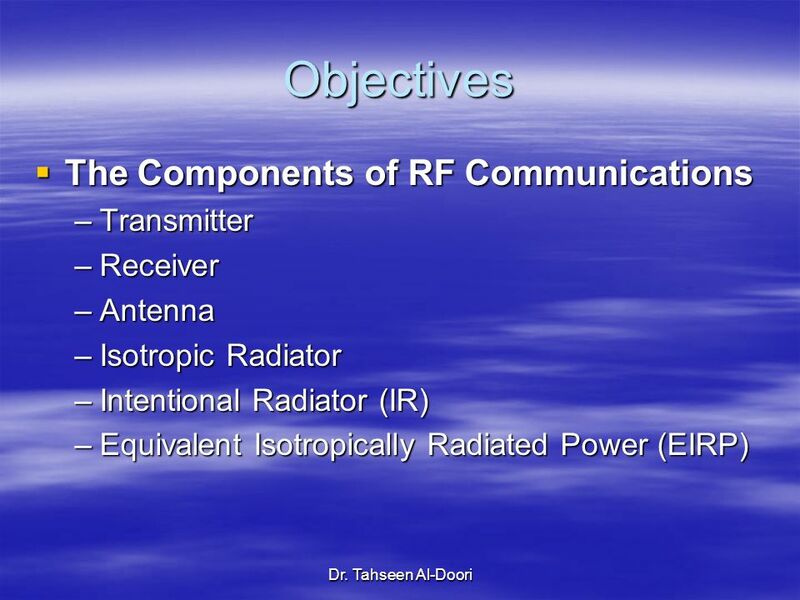 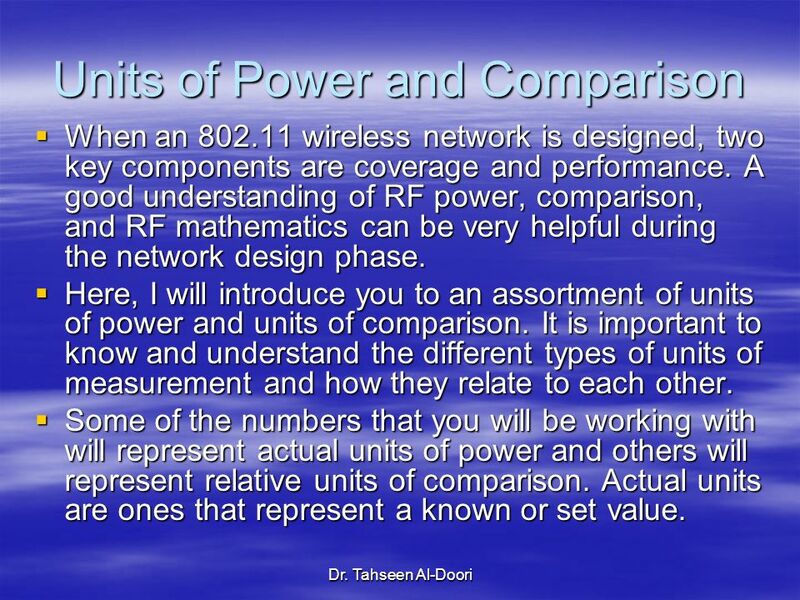 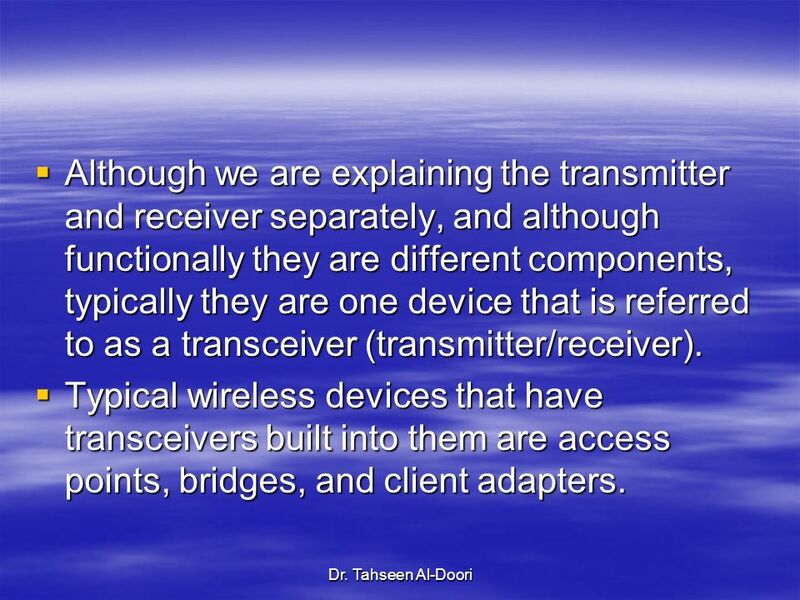 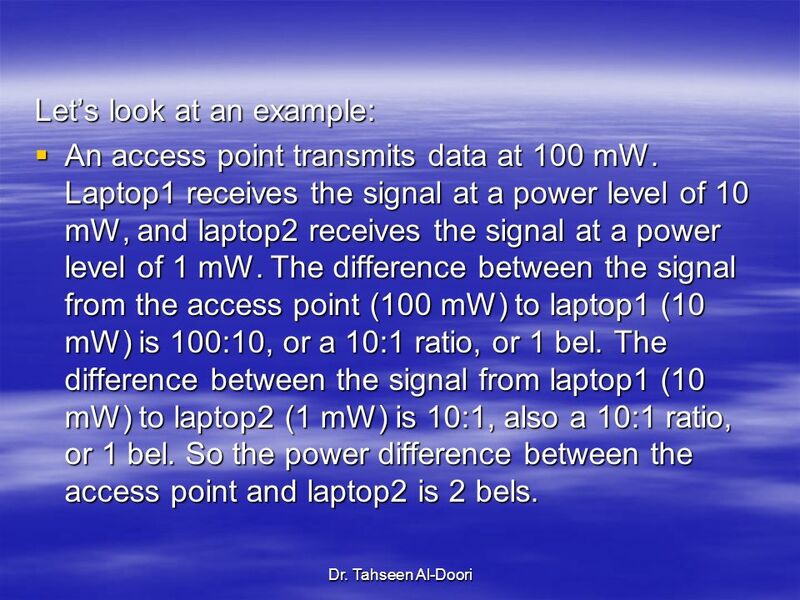 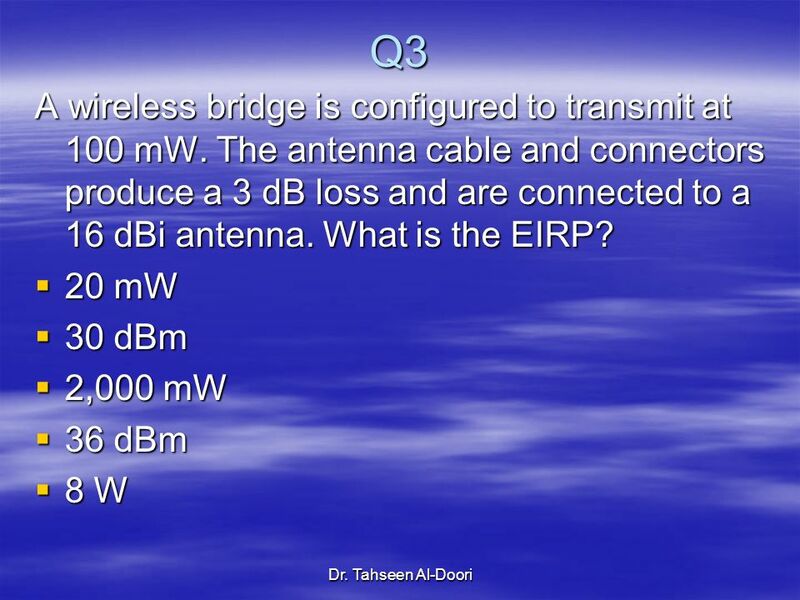 Chapter 02 Radio Frequency & Antenna Fundamentals (part 2) Center for Information Technology.